Skip the one-off content marketing efforts. That’s fine for just-in-time social media engagement and staying top of mind but more is needed for your major content efforts. Therefore, plan to capitalize on each content effort to maximize your content marketing resources because your budget and human resources are limited. 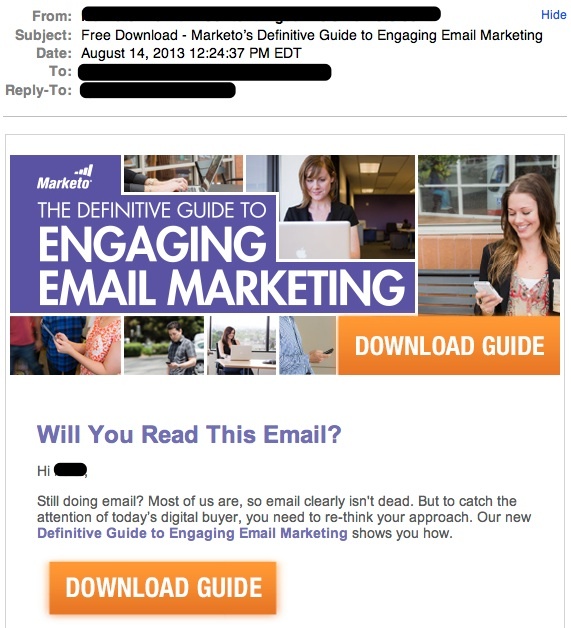 For an example of how to maximize each content effort, examine what Marketo did with The Definitive Guide to Email Marketing. 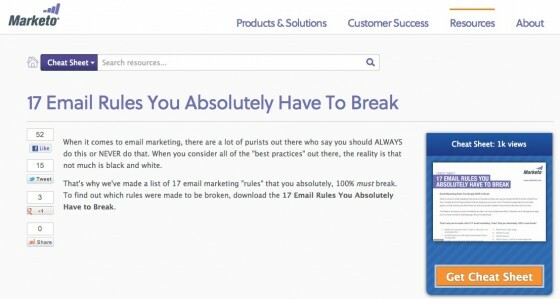 From that effort they created related content including a checklist with a great title, 17 Email Rules You Absolutely Have To Break, and a webinar, 4 Reasons to Automate Your Email Marketing Campaigns. They reached out in different ways across owned and social media supporting the effort with a PPC campaign. 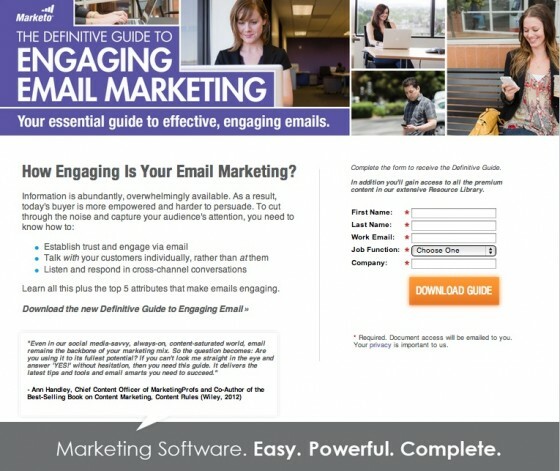 To maximize those results, they used a tailored landing page. 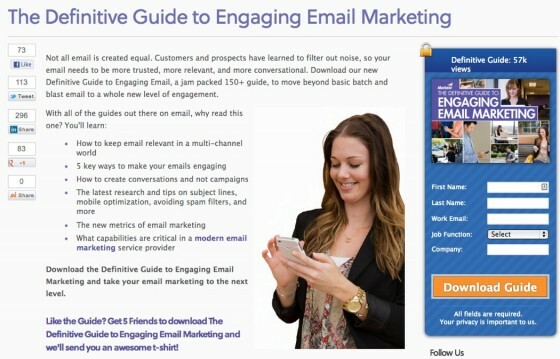 Here is the Definitive Guide to Engaging Email Marketing. Here are two examples of related content created around the Definitive Guide. Here are 2 samples of the emailings supporting this marketing effort that I received in my inbox. Additionally, Marketo supported this significant content marketing effort with paid search advertising and a related landing page. To ensure that you take full advantage of each content effort, follow these 3 steps. 1. Plan to repurpose content in advance. Map out content reuse. Determine where and how you’ll use the content across platforms in advance. Adapt content to fit different platforms. Remember that one size doesn’t fit all for information distribution. You need to make it contextually relevant. Leverage owned media. Think in terms of publishing the full piece of content (which requires adaptation to the specific context) as well as promoting links to the information. Maximize social media reach. Distribute the content on your social media bases. 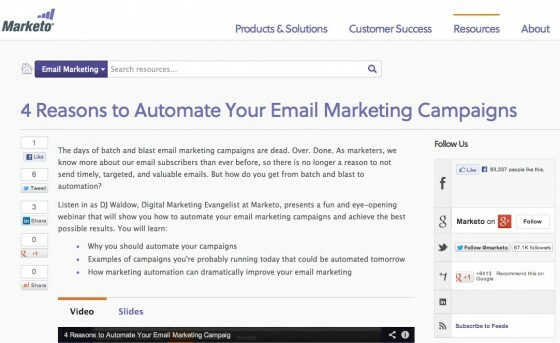 Integrate social sharing buttons as well as ClickToTweet and Pin This options. Don’t underestimate the value of your employees sharing your content on their personal identities. Utilize third party sites. Craft tailored guest posts or articles and allow others to reprint your content without cost. Tread lightly when promoting your content because content marketing should be void of marketing-speak. Position it as content distribution support. Create a press release. 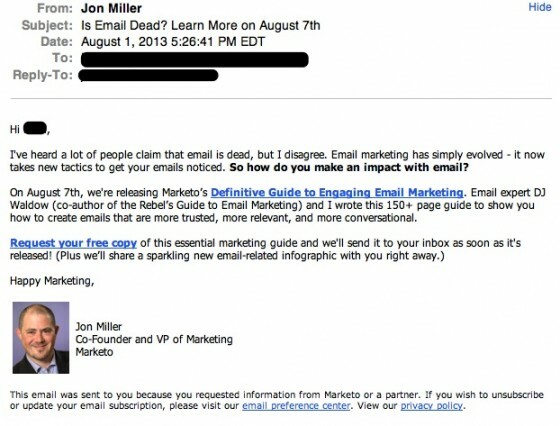 While this tip sounds old school, press releases are still a great way to get your content out. Skip the “me, me, me” because bloggers and journalists consider that a yawn. Instead, incorporate multiple content formats and use a strong hook. Add paid promotion. Give your content a nudge with targeted, paid advertising on search and/or social media. This requires a budget and may involve a learning curve. Improve your results by using a tailored landing page. Maximizing your content marketing resources requires planning ahead so that you can create multiple pieces of contextually relevant content out of each effort and distribute them where appropriate. 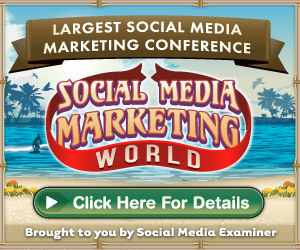 Social Media Marketing World is Social Media Examiner’s mega conference in San Diego, California at the waterfront Manchester Grand Hyatt. It includes a networking party on a naval aircraft carrier and much more! Presenters include Chris Brogan, Mari Smith, Michael Hyatt, Jay Baer, John Jantsch, Amy Porterfield, Mark Schaefer and experts from more than a dozen brands—just to name a few. Did you miss me at Content Marketing World 2013? Content Marketing World 2013 brought together the leading marketing thinkers and practitioners from around the globe. Over 1,700 marketers from 40 countries attended the annual event in Cleveland. But don’t worry if you couldn’t attend – or missed a valuable session – Get all the content of CMWorld 2013 OnDemand now! Photo Credit: (c)2013 – Heidi Cohen – All rights reserved. Limited rights to use if you link back to this post. The post 3 Steps to Maximize Content Marketing Resources appeared first on Heidi Cohen. This entry was posted in Getting Web Traffic, Marketing, Video Marketing and tagged Content, Marketing, Maximize, Resources, Steps. Bookmark the permalink.